With introduction and widespread use of combined antiretroviral therapy (cART) a marked shift in causes of hospitalizations and deaths have been observed among HIV-infected individuals, with a relative increase in non-communicable diseases (NCD) and non-AIDS-defining infections [1–3]. Among NCD, cardiovascular diseases (CVD) represent a major challenge. HIV-infected individuals have a higher risk for CVD such as myocardial infarction (MI), stroke, heart failure, and sudden cardiac death [4–7]. Although a higher burden of traditional CVD risk factors have been reported in HIV-infected individuals [8, 9], an elevated risk remains even after adjusting for these factors [10, 11]. Additionally, chronic exposure to cART [12, 13], HIV infection itself, and HIV-specific clinical parameters, such as detectable HIV-1 RNA, and nadir CD4+ count ≤50 cells/mm3, may also contribute to this increased CVD risk [14, 15]. 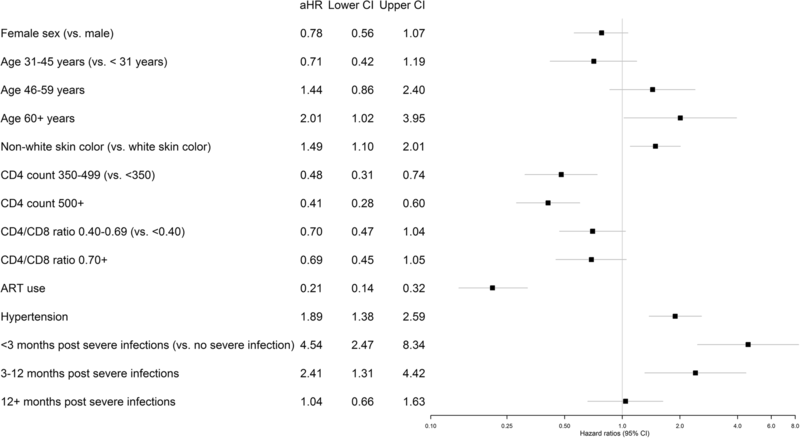 Another strength of our study is the characterization of a protective effect of cART use, and high CD4 counts (> 500), on the CVD risk of HIV-infected individuals who survive hospitalization for severe infection. This data helps to build the body of evidence of an overall benefit of cART use on CVD risk [10, 31, 32]. cART is able to attenuate inflammation and endothelial dysfunction among HIV-infected individuals [32–34], factors considered to play a key role in the increased CVD risk of this population [35–41]. We have also observed a borderline association between reduced hazard of CVD events and high CD4+/CD8+ ratio (≥ 0.7), a marker of increased innate and adaptive immune activation, and higher risk of morbidity [42, 43]. 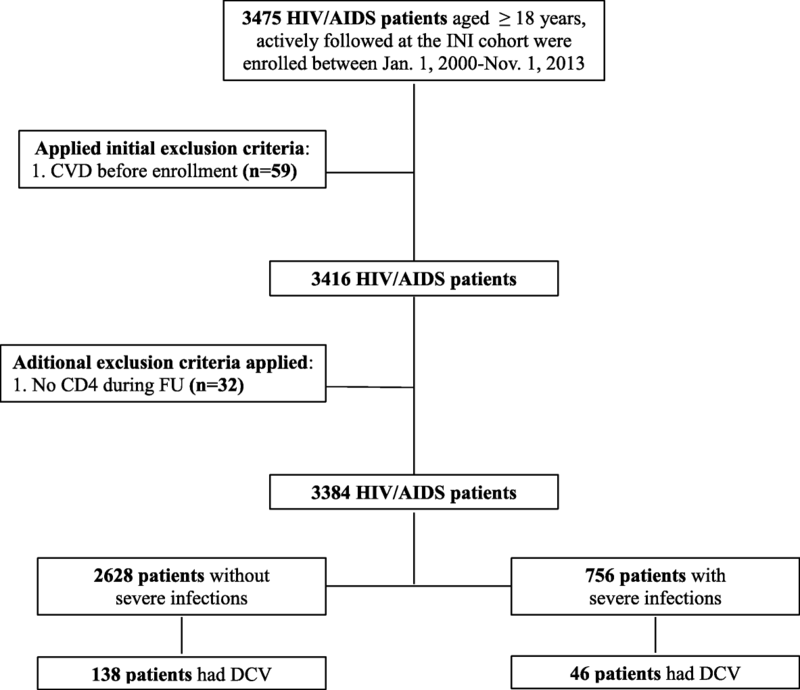 This data, together with the protective effect of high CD4+ counts aforementioned, is in accordance with previous data from our group and others, demonstrating a protective effect of virologic suppression and preservation of CD4+ counts on incident CVD [8, 15]. 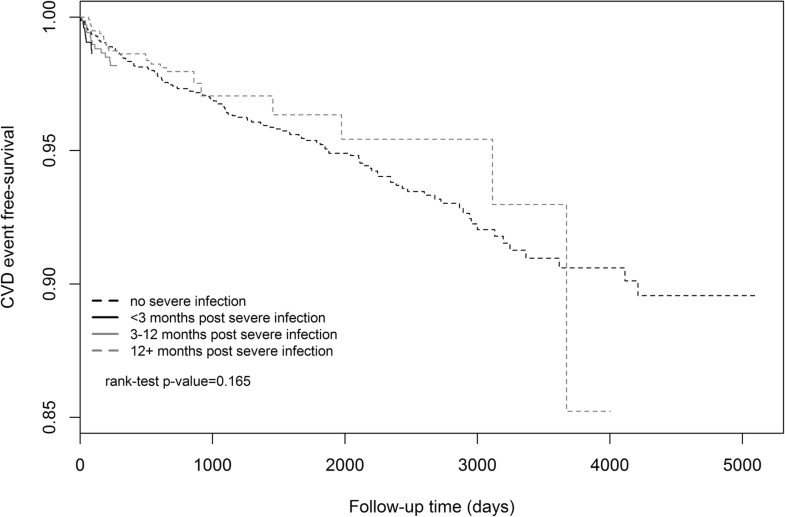 The role of acute infection as short-term risk of CVD have been explored in the general population [28, 44–48]. Similarly, our results suggests that a past medical history of hospital admission for severe infection (at least in the past year) should be part of the clinical assessment of cardiovascular risk performed by HIV/AIDS caregivers.